Earlier today, Twitter held a press conference where-in it revealed it’s new building along with the news of it’s major redesign. The whole event was nicknamed as Fly Twitter for the obvious reason that Twitter wanted to show-off it’s new design to the media people present at the conference. Along with the web interface redesign, they’ve already designed and rolled-out updates to the mobile versions of twitter i.e. for Android & iOS. It’s interesting that they’ve chosen to preview this new design on a page named as Fly Twitter as well. 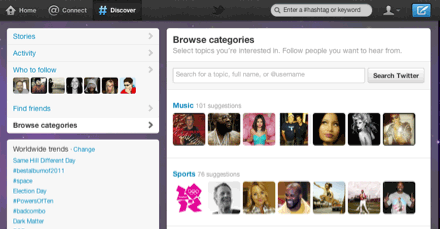 Basically this new design of twitter is going to revolve around 5 main pages viz – Home, Connect, Discover & Me (i.e. Your Profile). Design wise, they’ve done a big overhaul by shifting the right sidebar (so to speak) to the left side. The blue-white combo remains the same except some gradient variations in the default blue twitter color. Before we proceed into the details, take a look at this Official video uploaded by Twitter. Let’s briefly see each of those pages to get a fair idea about this new design and it’s functionality. As you can see in the image above, there isn’t much evidence of a change in the elements present in the Home tab. Yes, you can see slight changes made in the box style along with visible margins being left. But all that don’t count as major changes. Basically this Home tab will be your timeline as it has been for all this while. 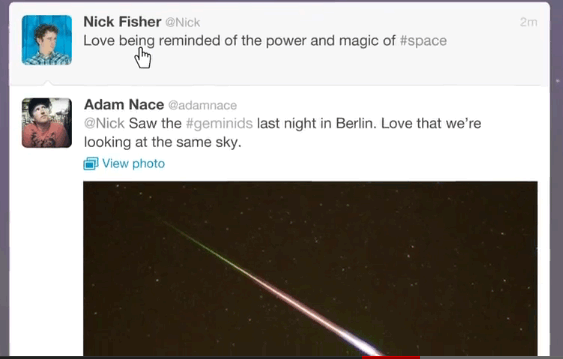 The only significant change (which appears in the image or the video) is that of the expanded tweets. Previously when we used to click on image or video embedded tweets, a new division used to slide-out from beneath. Instead of that from now on the tweets will expand vertically when clicked. These expanded tweets will display the ReTweets made to that particular tweet along with the favorite count & the images/videos. In fact it’s an improved version of the @username tab. Connect segregates your Mentions & Conversations. Sounds a little weird because mentions ultimately will be counted as a conversation but that’s what we get to see from the video they’ve released. A new feature that is added in Connect is that of username searches. At this point of time we can only assume that when a user enters a username into the search box all the interactions with the other user will be displayed. Discover – Find what’s #Buzzing around! Needless to say that the Discover tab is a visually improved search results page. Unlike the default search function, it will combine the keyword or hashtag you enter with a similar trending image or video. It’s very similar to the What’s Hot? section on Google+. The current Activity tab is soundly included in this page along with other default features like Who to follow & Find friends. One thing that gives Discover a new aura is the Browse Interests sub-tab. It lists out all the categories nicely and also suggests the no. of people tweeting about it. Again this is another kind of search, but a categorical or grouped one. Which seriously looks good. The profile page hasn’t changed a bit (apart from the design or positioning). You can access your Direct Messages (DMs) from this page and also take a look at what you’ve tweeted. I hope this post gave you a preview of the new design which will be rolled out by Twitter (soon enough). We’ve left out the Tweet button update intentionally as it’s a real minor change. How to get the New Twitter Design Immediately ? Firstly thanks to @laemo & @razarahil for passing on this little trick. Just update your Twitter for Android/iPhone (iOS) app to the latest version. Then you will automatically see the new design in the web interface as well. 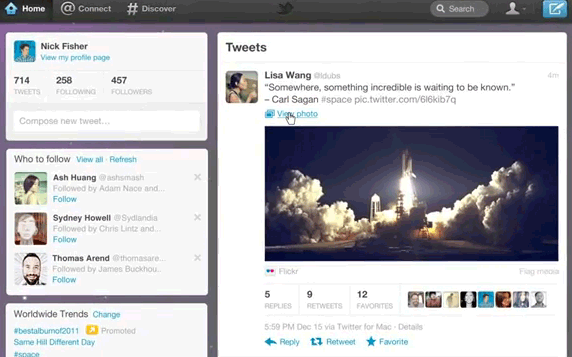 Do you like Twitter’s New Design or shall I put it this way, Did you like the Twitter Flight ? Great news for all. It’s time to change which will be help to make your different identity on one of the great side of social media.